…and, if so, was it accompanied by a fiddle player and a strange Dolly Parton-esque angel? Were you visited by the three wise cowpokes? This entry was posted in bethlehem is where now?, fashion police on December 13, 2007 by admin. I wonder if Mary kept her hat on during delivery. This may win for worst ever. Actually, I find that this particular nativity evokes even more signs of the miracle of Christ’s birth than any I’ve ever seen before..
How did she even GET into jeans that soon after giving birth? Turly, a miracle. Why would Mary even consider marrying a man who wore chaps, even if he DID agree to step in as father to her illegitimate child? Truly, a miracle. Yes, this, above any I’ve ever seen, makes me believe in the power of Christ. Now, if I were going to design something like that, I’d probably have gone so far as to put the fiddler on the roof. Don’t fiddlers naturally belong on the roof. Okay some may say that the fiddler on the roof is a Jewish tradition, but in 0 AD there was no Christian tradition, so the fiddler wouldn’t have known better. This is actually quite a PC nativity. I mean they actually have a Black wiseman/cowboy! Don’t see many of those in Country music, but he made it into the stable! You go, Brother! Call me sexist, but a fiddler is more of a male occupation, while Angel is relegated to blonde females. I think that is why Dolly is up on the rooftop, and the fiddler down below with his harmonica-playing-sidekick-wiseman. Is it just me, or are you suspicious of the dude standing behind the horse? If I were that horsie, I’d be a bit nervous of his motives. Maybe that’s why the sheep has moved away from the barn. These nativity scenes do not lead me to have very Christian thoughts! LOL! I’m still wondering how exactly they all got to a 1800’swesternUSesque barn from first century Bethlehem. musta been quite the commute. and why are they all pasty european skin white? I thought Fiddler on the Roof was a jewish thing . . . 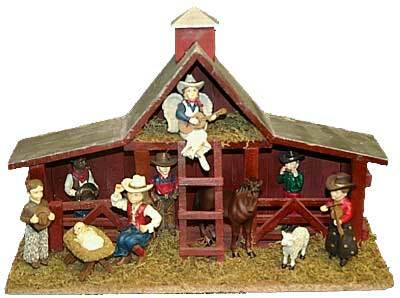 So why is Slim Billy Boy Jesus lying outside the barn, while the Three Wise Cow Pokes are kickin’ it INSIDE the barn? Even the horse gets some back side shelter from the elements while the baby lies open to the elements! And Hot Damn, Cowgirl Mary looks mighty fine in them jeans! I guess she’s off to the OK Saddle Bar.